Old German States Prussia – Postal stationery, 1855, postal stationery envelope 3 Sgr. yellow, very fine, with two frame cancel “Düsseldorf 8 / 11” (1858), to St. Louis / USA. Ng. Two ring cancel red “Aachen PAID 25 / CTS. 9 / 11” (VdL. 9) and single circle postmark “N. York BR. PKT. 30 PAID NOV / 26”. The total postage was 13 Sgr., from which 3 Sgr. through the postal stationery and 10 Sgr. in cash satisfied were. In this kind a franking rarity from virtu. Expertized Brettl / BPP. Certificate with photograph Van the Linden / BPP. 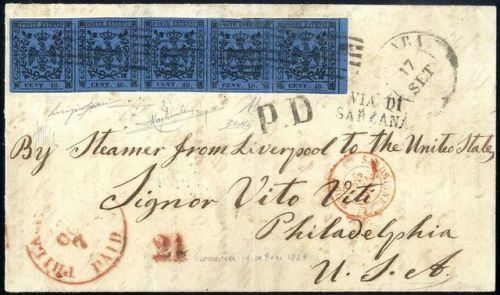 Great Britain – Postal stationery, 1877, 1 penny, 2 items as additional franking on 1/2 P. postal stationery postcard from London to Germany. Scarce use one postal stationery postcard abroad to the letter postage, because these the Universal Postel Union directions as card not yet corresponded! Switzerland, 1893, 5c Jubilee. 6 registered postal cards mostly sent to Germany and uprated with 30c tied by “Zurich 24.XII.93” cds, Very Fine. Estimate; $200 – 300. 7 1/2 Pfg. paid reply postal card with an additional Germaniafrankatur from Gdansk Long load 7. 5. 20 with a lot of text to Berlin. Old examination Hochkeppeler. Left 2 documemt holes closed.